What about if you want to add video MKV, AVCHD (.mts, .m2ts), OGG, OGM, VOB, RAM, RMVB, WebM, bik, WTV, MXF, MVI, Xvid, Divx, OGV, MP4, MOV, 3GP, AVI to PDF with Acrobat X Pro, Acrobat 9 Pro and Acrobat 9? In order to embed various kinds of video and solve “PDF won’t import MP4, MOV, 3GP, 3G2 issue”, you will need a video converter program to convert the video to FLV for directly place video to PDF. This article includes a step-by-step guide to convert various kinds of video to PDF compatible FLV or MP4 for embed video to PDF as well as a detailed guide to embed video to PDF with Adobe Acrobat. 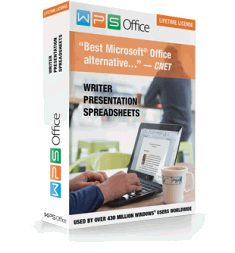 Press on “Add file” button to add your source files to the program. Or you can just drag and drop your files to the program interface. Click on “Profile” drop-down beside “Settings”and choose “FLV – Flash Video Format (*.flv)”, “SWF – SWF Format (*.swf)”, or “H.264/MPEG-4 AVC Video (*.mp4)” from “General video” category. Or you can directly search with keywords “mp4, flv, or swf” in the “search box” to easy find the profile. Tips: FLV, SWF or MP4? which format to choose? 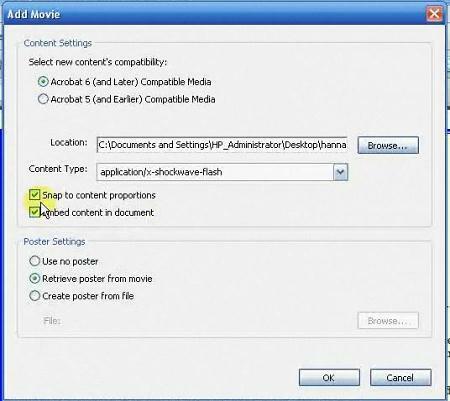 If the content embedded in the pdf is flash .flv or .swf format then flashplayer will be needed to view it. Nearly 99% of the world’s internet users have flashplayer installed. In order the embedded video can be played with ezPDF Reader on the iOS iPhone/iPad/iPod touch or Android phones, H.264 MP4 video is recommended. Press on the big blue “Convert” button to start conversion. 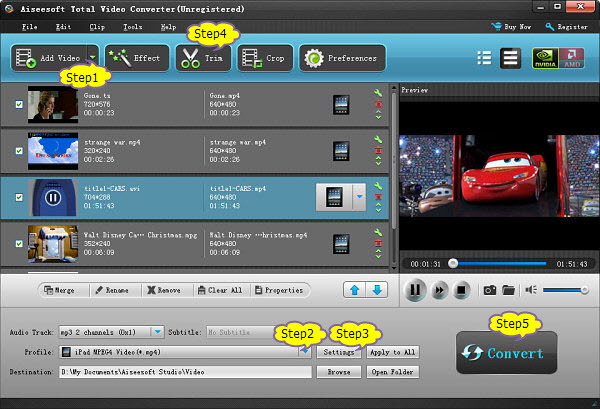 Choose Tools > Advanced Editing > to select the Movie Tool. 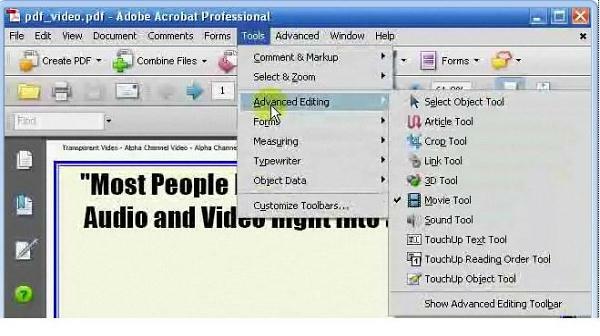 In the latest Acrobat, choose Tools > Content > Multimedia and select the Video tool. If you double-click the page, Acrobat places the upper-left corner of the video where you clicked. If you drag an area on the page, the media is placed within the area. The play area of the video is the exact size of the video frame (if Acrobat is able to read the video clip dimensions). Click Browse to find the media file, and then click Open. 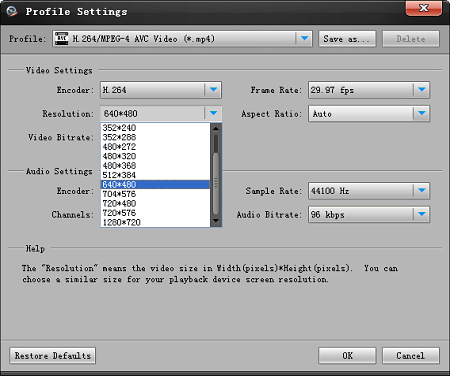 Use the advanced options on the Insert Video dialog box to change the media if needed, and then click OK. Not all of these options are available for all media types. Check the option, so you can send PDF right in the the document. Otherwise, make sure the video are in the same folder with the PDF. Before creating a PDF document, create a new folder to store your PDF and the video you want to embed to PDF.